Fortress describes two schools of fencing: Spanish and Italian. 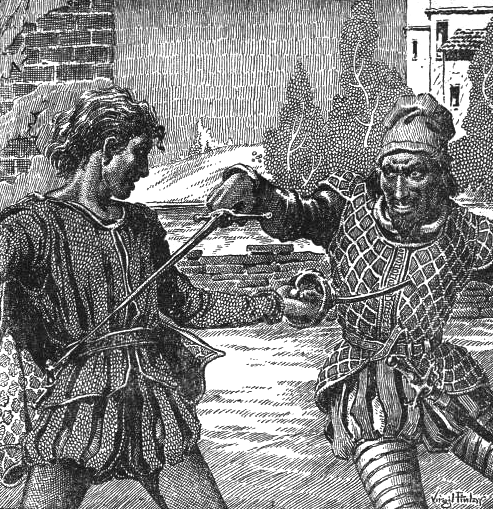 ...an Italian style swordsman cannot be attacked with a small- or medium-sized melee weapon if he has the initiative. His opponent, regardless of his school, must win initiative in order to attack. In order to parry, the character must have a dagger in his left hand or have some other sort of protection for the hand. A leather glove, a cloak, or a floppy hat are the most common; a silk handkerchief is sufficient. In 1986, Mayfair Games published a 'Role Aids' adventure called Beneath Two Suns. This product is an “authorized and approved module” based on the Dray Prescot series of sword & planet novels. By sheer coincidence, the Age of Dusk blog today posted a review of this adventure. The superficial details I discuss here are largely distinct from the cogent Age of Dusk review, so your kind perusal of that review will not be a waste of your time (assuming you do not consider reading a review of a 32 year old RPG product to be a waste of time. Then again, you wouldn't be here, would you?). Beneath Two Suns takes place on the Antarean planet Kregen, specifically the city Zenicce (similar to Renaissance Venice). In Zenicce, “bands of thugs and hoodlums” use Florentine fighting; hence, such rules are necessary. Also, two of the provided pre-generated characters are trained in Florentine fighting. Florentine fighting costs two weapon proficiency slots with rapier and dagger proficiencies as prerequisites. Florentine fighting can only be used when armed with either (i.) a rapier and a dagger or (ii.) two daggers. A character “using Florentine fighting is allowed twice as many attacks per round.” However, unless a character using Florentine fighting has a Dexterity of at least 16, the character suffers “a -1 modifier on his to hit roll.” Additionally, a character “engaged in Florentine fighting has his Armor Class increased by 1 (-1) against all close-in melee attacks,” but this modifier does not apply against attacks from the rear. It is assumed that player characters participating in the adventure are not native to Kregen. The adventure is intended for four to six characters of levels 6 - 8. The “majority should be fighters” (but paladins are not allowed); however, we are advised to include “at least one magic-user of not higher than skill 6 and one cleric of skill 6 - 8 in the party.” (“Skill” is Mayfair non-trademark-infringing-code for experience level.) The Player Introduction implies that “smashing orcs” is “normal business” for the player characters prior to seeing the star Antares sparkle and being “mysteriously transported from Earth to [the] strange, wild planet called Kregen.” This suggests there are orcs on Earth or – on a fantasy campaign world called Earth – the constellation Scorpio is visible. The eight pre-generated characters are all from different time periods on Earth. Some of these characters are Dray Prescot himself, a “Centurian” (sic), and a Victorian cutpurse named Careful Dodger. Other characters have magical abilities; for instance, Lo Khan – a Mongol ranger – has the “Speak with Animals” spell available. Evidently Greek, Tyresias Homer is a “Skill 8 Cleric” and is described as a “Healer.” Additionally, Ramseus is a “Skill 6 Mage” who is a “Wise Man” of an unspecified time period and culture. The Player Introduction also explains that – on Kergen – the player characters “are in slaves' chains and are dimly aware that [their] bodies have been functioning for several weeks without the benefit of [their] full consciousness...[and they] retain a dim memory of the past weeks and have learned something of [their] strange circumstances...” This explains how the player characters have picked up something of “the universal language of Kregen.” It does not explain how they can read a message in a bottle they find. Perhaps the 'Read Languages' ability of the Victorian cutpurse (40%) comes into play here. The player characters arrive on Kregen with “no items other than the clothes on their backs and the shoes on their feet.” For the duration of the adventure, the belongings of the characters “are kept in 'limbo. '” Given that first edition rules are in effect, the absence of material components and his spellbook would be especially problematic for Ramseus. Have you ever wanted to use the history of your home town as the basis of a rollicking RPG adventure? Neither have I. Yet Tom Moldvay, not being me or you, took the idea and ran with it until he couldn't run any further. Had Moldvay come from Chicago or San Antonio, this probably would not merit mention; however, he hailed from the Buckeye State... specifically Akron. Lacking the élan of Cincinnati or the gravitas of Cleveland or even the je ne sais quoi of Toledo, Akron might not be the most marketable of Ohio's cities. Maybe it was home town pride, maybe it came about because of a dare; regardless, the third (and last) of the Lords of Creation adventures features the (former) Rubber Capital of the World. Toss in a dead abolitionist and – in Moldvay's estimation – you have suitable components for a commercially successful role-playing romp. Omegakron is dedicated to three TSR alumni: Mark Acres, Jim Ward, and Steve Sullivan. Given the time travel aspects of Omegakron, Acres makes sense due to his association with TIMEMASTER. Given the gonzo post-apocalyptic nature of Omegakron, Ward makes sense due to his association with Gamma World. Various factions exist in the Omegakron area, some of which are races of intelligent, mutated animals. There are anthropomorphic raccoons who ride semi-intelligent buffalo, anthropomorphic woodchucks who ride semi-intelligent wolves, and anthropomorphic squirrels who ride mutant rhinoceri. Although not anthropomorphic, there are also intelligent tigers and bears. Player's Aid #1 is “A Short History of Akron,” a pamphlet with eight pulse-pounding pages of canal building and rubber litigation. This pamphlet “contains clues woven into the manuscript which will help the characters solve most of the mysteries in the vision of Prometheus.” The player characters are meant to find this pamphlet early in the adventure; however, the location of the pamphlet is considered sacred to the intelligent animals. When the intelligent animals catch the player characters violating their shrine, they give the characters three options. The first option is to fight against a hundred animal warriors and undoubtedly die. The second option is to submit to a trial in which “one character chosen at random will be killed.” The third option is to endure an ordeal that will allow the characters to become tribal members, thereby absolving them of their trespass. The ordeal consists of running along a path to the Cuyahoga River while avoiding booby-traps and fending off animal warriors. In game terms, the ordeal “has been designed abstractly.” This means the characters will have 41 - 60 chances for encounters in the course of the ordeal. For each chance, 1d10 is rolled; a result of '1' indicates an encounter and a table is then consulted. So, 1d10 is rolled up to sixty times. The adventure even acknowledges that “it can become boring for the players to watch the GM roll dice.” Why not just have 4 - 6 encounters? One of the factions in Omegakron is Novos Akros. It has a high level of technology, including longevity treatments and “a small intergalactic spaceport.” Novos Akros has a small 'Manager' class that exerts Orwellian control over the 'Worker' class. A 12-hour work day is still common in Novos Akros. Education stops at age 12, when the youths join the labor pool. Workers are kept hopelessly in debt. Any rebellious attitude is immediately crushed. Offenders are kept in a state of drugged obedience. To maintain the sophisticated technology of Novos Akros, there are “about 1500 technicians on loan from Old Akron,” a democratically ruled faction established at the University of Akron. Old Akron has a level of technology roughly equal to the late twentieth century. For reasons not explained, Old Akron helps a tyrannical regime maintain a technology superior to that which Old Akron enjoys. The Akros Rangers are the police force for Novos Akros. Rangers are recruited from personnel not native to Novos Akros. The player characters are enticed into Novos Akros so they can be drafted into the Rangers. Anyway, the player characters encounter the ghost of John Brown who wants to liberate the “wage slaves” of Novos Akros. 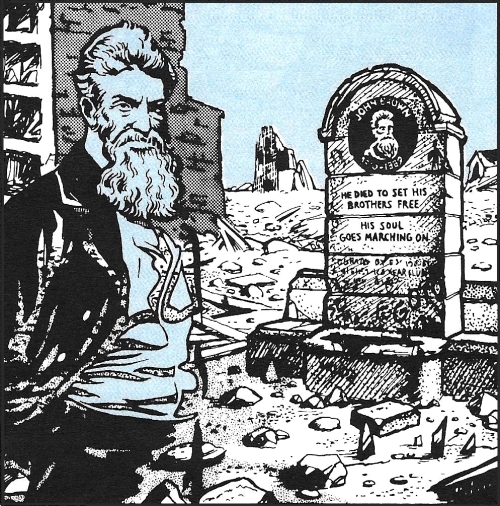 (“For the adventure to work best, it is suggested that the GM make sure the characters join the Akros Rangers before meeting John Brown.”) The player characters can successfully foment a worker revolt in Novos Akros only if they steal a copy of the Bill of Rights from Old Akron. 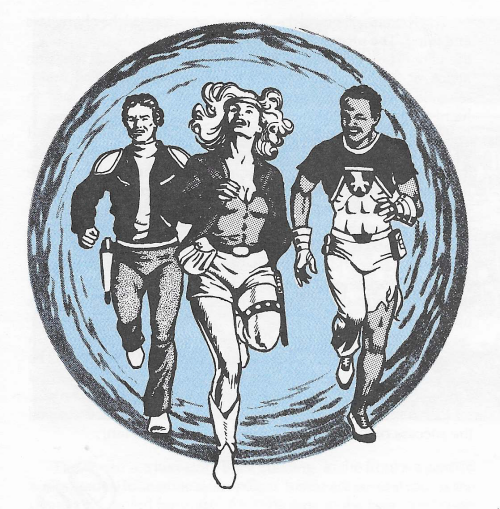 By completing all of their missions, the player characters “opened the way” for the Time Adjustors, “a mysterious group of individuals who strive to maximize the time flow.” (Maximizing the time flow entails the preservation of the branches of time “which lead to the most successful of all possible futures.”) The Time Adjustors explain to the player characters about such concepts as time flow, temporal shift, and probability branches. The Temporal Adjustors can recruit the player characters to seek out the reason for the temporal shift that redirected the main time flow toward Omegakron. This would have lead to the fourth, unpublished Lords of Creation adventure, The Towers of Ilium. Moldvay claims “the GM should be free to use his impression of the Time Adjustors” and thus provides little detail about them. 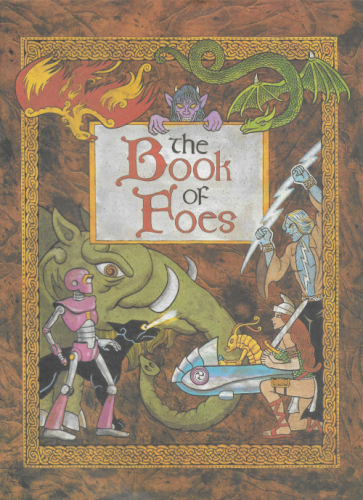 Included in the Lords of Creation boxed set was The Book of Foes with 64 pages (including covers). According to the book, 'foe' is a term of convenience for “any being who is not a character.” This broad term includes animals, gods, extraterrestrial species, folklore races, legendary beings, historical persons, mythological monsters, and figments of Tom Moldvay's imagination. Beings tied at having the least experience value are baboons, cobras, (average) goblins, (average) mandragoras, and wolves. An entity named Romerac Elerion has the largest experience value. Romerac Elerion (rom'-er-ac el-er'-e-on) seldom appears twice looking the same. His favorite guises are a pot-bellied, balding man with a beard; a 7 foot tall gray-eyed blond man with a jagged lightning scar criss-crossing his body; a brown-haired, blue-eyed minstrel; a tawny-colored Feline; a dwarvish jester dressed in multi-colored rags; a small gray cat; and a 200 foot long Dragon. Romerac is whimsical, but once his fancy is caught he follows the whimsey to the end with rock-hard purpose. He has all skills and powers. ...looks like an ordinary human man but he is actually one of the most powerful Lords of Creation. Wayland is the master technician. He can build almost anything. He specializes in fantastic creations and has built many of the powerful objects in the world. He also takes contracts for constructing special “pocket universes”. Wayland has all powers and skills. He sometimes goes by the name of Welland or Wayland Smith. One of the settings described in the Lords of Creation rule book is the Elder Lands, featuring fantasy versions of various cultures of the Bronze Age (more or less). 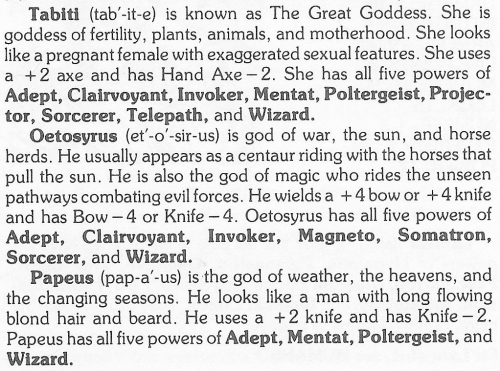 This allows Moldvay to include in The Book of Foes game stats for gods who didn't make the cut for Deities & Demigods. Among these are the gods of the Scythian pantheon. Acephali (ak-e-fal'-e) are six foot tall creatures with brown, barrel-shaped bodies. They have three legs arranged like a tripod and two long tentacles instead of arms. They have three eyes spaced out around their bodies for all-around vision. Acephali can teleport through space, time, and other dimensions. Wrapped in their tentacles, Acephali can carry six small individuals, three human-sized individuals, or one large individual. Kinnara are described as “thin, 5 foot tall humanoids with oversized heads.” They are telekinetic. ...clones of psychotic killers with a genetic disposition toward murder. They are raised in an environment designed to foster paranoia then surgically altered to be more efficient killers. Ownership of a Psychokiller is highly illegal. A Psychokiller is an arch-assassin, never stopping until its victim is dead. Psychokillers have the powers of Plasteel Body, Exoskeleton, Backup Metabolism, Physical Control and Energy Control. It's “highly illegal” to own Psychokillers? When you outlaw Psychokillers, only outlaws will have Psychokillers. Is it only slightly illegal to make them? How do Psychokillers feel about being owned? 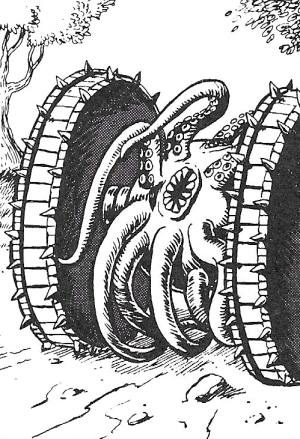 Scavenger Wheels are animals that have a 4 foot wide, spherical body covered with tentacles between two 6 foot tall, wheel-like appendages. 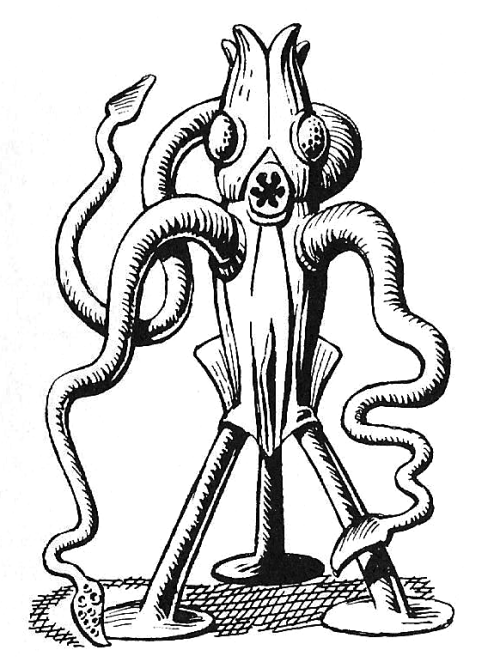 They hunt by rolling over the ground (usually wind blown, though they can move laboriously to a hill top, using their tentacles, then rol down when they sight prey). As they roll over prey, they scoop it into their mouths using their tentacles. 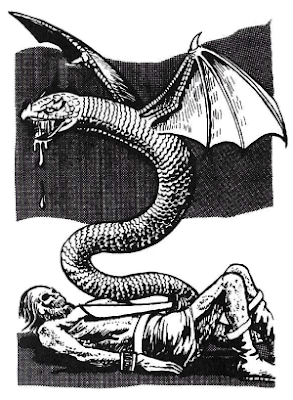 According to page 61, “Vorian Death Maggots are winged serpent-like creatures 10 feet long.” The never-published fifth Lords of Creation adventure was to be titled Voria. Doubtless, these venomous foes would have played some part.